When playing Stranger Things: The Game, factors such as knowing how to get all 40 Heart Pieces can help see you through to the end. There are a wide variety of collectibles in the game, but Heart Pieces may be among the most important. Because there are a grand total of 40 Heart Pieces, finding them all can take a bit of time. To help speed up the process, we’ve put together a quick guide on how to get all 40 Heart Pieces in Stranger Things: The Game! Below, we list how you can get all 40 Heart Pieces in Stranger Things: The Game. Heart Piece 1: To get Heart Piece #1, head inside Hawkins Lab with Nancy (you can only get this Heart Piece with Nancy in your party). Heart Piece 2: To get Heart Piece #1, you’ll need to destroy all five surveillance cameras in Hawkins Lab. Heart Piece 3: To get Heart Piece #3, head to Hopper’s Home (the Heart Piece can be found inside). Heart Piece 4: To get Heart Piece #4, head into the Forest, then have Dustin use pudding to move the bear. Heart Piece 5: To get Heart Piece #5, head left from Castle Byers into a small forest (left of Joyce’s Home) to find it. Heart Piece 6: To get Heart Piece #6, all you need to do is give Powell his handcuffs. Heart Piece 7: To get Heart Piece #7, you’ll need to explore the Corn Maze. Heart Piece 8: To get Heart Piece #8, locate Mr. Clarke and give him the Science Textbook. Heart Piece 9: To get Heart Piece #9, head to the Librarian’s House then jump over a ramp (you’ll find the Heart Piece above the Librarian’s House). Heart Piece 10: To get Heart Piece #10, explore the Bunker Pipe Maze. Heart Piece 11: To get Heart Piece #11, explore the Sewers. Heart Piece 12: To get Heart Piece #12, you’ll need to pop all of the balloons found in the Sewers. Heart Piece 13: To get Heart Piece #13, head into the Forest Maze with Will (you’ll need Will in order to get this Heart Piece). Heart Piece 14: To get Heart Piece #14, all you need to do is break every fire alarm in Hawkins Middle School. Heart Piece 15: To get Heart Piece #15, head into the Forest Maze and break all of the owl and bird houses. Heart Piece 16: To get Heart Piece #16, head into Hawkins Library and collect all of the overdue books, then open the chest found at the front of Hawkins Library. 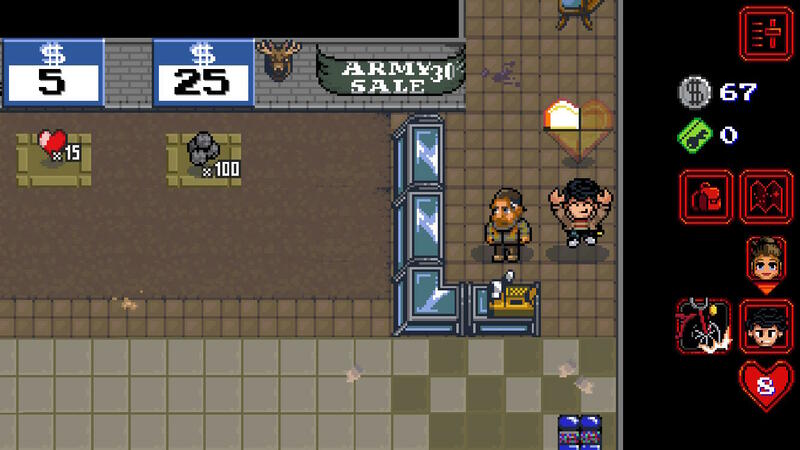 Heart Piece 17: To get Heart Piece #17, simply smash all five alien jars inside Hawkins Bunker (note this opportunity will present itself in Chapter 6 of Stranger Things: The Game). Heart Piece 18: To get Heart Piece #18, you’ll need to give the Robot Toy to the Bradley’s Store Clerk. Heart Piece 19: To get Heart Piece #19, explore the Quarry. Heart Piece 20: To get Heart Piece #20, simply return the Pocket Knife to Tommy. Heart Piece 21: To get Heart Piece #21, give a Bottle of Pop to Tommy. Heart Piece 22: To get Heart Piece #22, find Carol and give her the bottle of Hairspray. Heart Piece 23: To get Heart Piece #23, give the tube of Lipstick to Carol. Heart Piece 24: To get Heart Piece #24, find Joyce and give her the Keys. Heart Piece 25: To get Heart Piece #25, give the Phone to Joyce. Heart Piece 26: To get Heart Piece #26, give Jonathan the Blank Cassette. Heart Piece 27: To get Heart Piece #27, give the Game Cartridge to the Bradley’s Store Clerk. Heart Piece 28: To get Heart Piece #28, find Mrs. Wheeler and give her the Milk Carton. Heart Piece 29: To get Heart Piece #29, give the Pumpkin to Mrs. Wheeler. Heart Piece 30: To get Heart Piece #30, find Flo in the Police Station and give her the Romance Novel. Heart Piece 31: To get Heart Piece #31, give the Rubber Skeleton to Flo in the Police Station. Heart Piece 32: To get Heart Piece #32, give the Police Badge to Callahan in the Police Station. Heart Piece 33: To get Heart Piece #33, find Melvald and give him the Ledger. Heart Piece 34: To get Heart Piece #34, select Will before talking to Jennifer. Heart Piece 35: To get Heart Piece #35, use the ramp to venture above Hopper’s Home (where you’ll find the Heart PIece). Heart Piece 36: To get Heart Piece #36, give Salt to the Hunting Store Clerk. Heart Piece 37: To get Heart Piece #37, explore the Mini Sewers Dungeon (near Jennifer). Heart Piece 38: To get Heart Piece #38, head to the southeast corner of the Garbage Dump, then follow a path down to a bike ramp and use the bike ramp to reach an island. On the island, Heart Piece #38 can be found by opening the green chest. Heart Piece 39: To get Heart Piece #39, explore the house near the Librarian and Florist. Heart Piece 40: To get Heart Piece #40, find Steve and give him the Movie Tickets. There you have it, a look at how to get all 40 Heart Pieces in Stranger Things: The Game. Which Heart Piece did you have the hardest time finding? Let us know in the comments below! For help with other collectibles, be sure to go back and check out where you can find all of the Eggos in Stranger Things: The Game, and where you can find all of the VHS Tapes in Stranger Things: The Game. By reading through this guide, you should now know how to get all 40 Heart Pieces in Stranger Things: The Game.